Have you ever wanted to visit Europe, but the thought of touring several countries is overwhelming? Have you considered doing a river cruise? I am 28 years old and went to Europe for my very first time in 2018 on a river cruise AND they are not just for the elderly! I thoroughly enjoyed myself and cannot wait to go on another one. River cruises are an amazing way to take a relaxed tour of Europe and you can’t beat the views from the comfort of your own ship. In the following, I want to cover some questions that I often hear clients ask. 1. 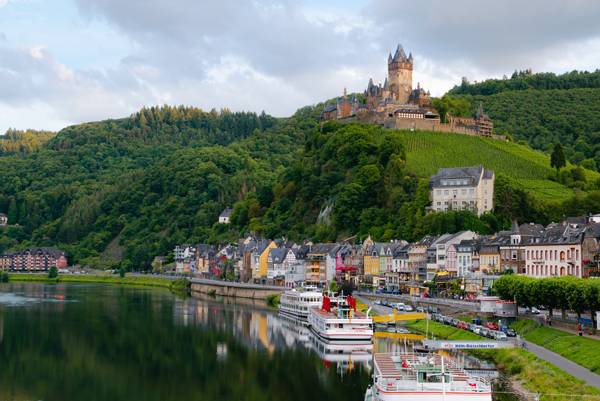 What’s the difference between a river cruise vs. ocean cruise? On Ocean cruises you will find pools, multiple lounges, specialty restaurants, spas and endless activities are available. Whereas on riverboats, there is likely just one lounge, one main restaurant with a couple of smaller dining venues. Ocean ships have passenger counts in the thousands, while riverboats carry 200 passengers or fewer. You won't be elbowing strangers to get to a table or the gangway, and the atmosphere is quite social so you quickly make new friends. Majority of sailing is done during the night and you'll miss most of it. River ship staterooms are smaller than their ocean ship counterparts, but they're not short on home comforts. River ships cabins face the water and range from window view to balconies. Best of all, there are few "sea" days. With the exception of particularly scenic stretches of river -- full sailing days are a rarity. 2. What is included in the cost of a river cruise? If you've griped about being nickeled and dimed on oceangoing ships, you'll find river cruise fares refreshing. Unlike ocean cruises, fares will typically include wine, beer and soft drinks with all meals, 24-hour tea and coffee and Wi-Fi. A standard tour is included in each port and you'll visit a new destination each day -- sometimes two in one day. Plus, most river ships allow you to bring wine back onboard that you've bought in local shops and vineyards. 3. Is there entertainment on board? You will not find any shows on the river cruise ... or guest comedians ... or karaoke. You will find a pianist or small ensemble on most ships, plus folk dancers, singers or other local troupes brought onboard for a quick evening show. During the day you can expect educational seminars and maybe a cooking demo, wine tasting or quiz. With river cruising the passing scenery and destinations visited are the main star of the show -- and after a busy day most passengers head for bed rather than stay up into the early hours. 4. What are the included excursions in port like? The ports, not the ships, are the key attractions, and you will certainly pack a lot of sightseeing into a week or two. This kind of travel can be exhilarating, but also exhausting. Bring comfortable shoes and don't be embarrassed to take a day off if you're getting overwhelmed. River cruise shore excursion is the walking tour, the kind where you follow a guide as they tell you details about the city's history and culture, followed by free time for shopping or a quick drink in a local cafe. The tours might be included, but there's no obligation to go on all of them. You have complete freedom to stay on board or go off exploring on your own. Late-riser breakfast starts around 9:30 a.m. -- and if you're eating then, you've likely missed the day's tour, which can begin as early as 7:30 or 8 a.m. River cruises are not for sleeping in, lounging around and proceeding ashore at a leisurely pace (unless you are planning to do your own thing and skip the morning excursion). My significant other hates ocean cruises, but he fell in love with river cruising. He never felt like he was about to go stir crazy on the ship because we spent so little time aboard. Having all of our tours included was amazing as we felt like we were able to get the full experience without having to pick and choose which tours we wanted because of extra cost. The food is also some of the best food we have had and being on a smaller ship felt so much homier that an ocean cruise. One of our favorite things to do was to lay in bed and open our sliding glass door and watch the passing scenery go by. We saw so many castles and quaint villages all from the comforts of our own bed. For anyone who is debating going to Europe but not sure how, then definitely give river cruising a try because it is amazing!! !